In the early days of Tristan's history, several of William Glass' children were sent to England and the Cape for schooling. Occasional visitors were also asked to help teach island children. The first teacher - Benjamin Pankhurst, arrived in 1830 for two years. Rev Taylor, Tristan's first minister, began a school, originally in William Glass' home, then in the largest Tristan house, built by Andrew Hagan which served as both church and school until 1923. 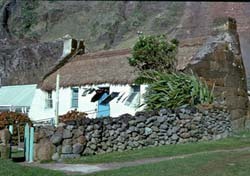 This house, still a Hagan home, was one of the last remaining houses thatched with New Zealand Flax when pictured (left) in the 1980s. During World War II an expanded school was provided by the Naval Station and a new school house was built. Sent by Martin Lewis, this picture shows the assembled pupils outside the old school situated in the 'station' constructed by the wartime naval station. The present school building opened in 1975. 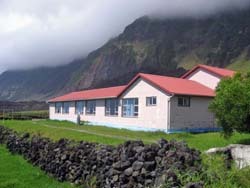 It now has five classrooms, a library, a hall with stage, a computer suite, a cookery room, and a craft/science room. 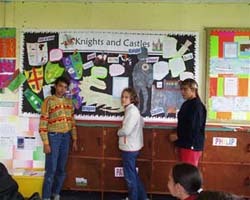 St Mary's School educates Tristan children between the ages of three and sixteen. Photograph by Janice Hentley shows the school assembled in the central quadrangle.